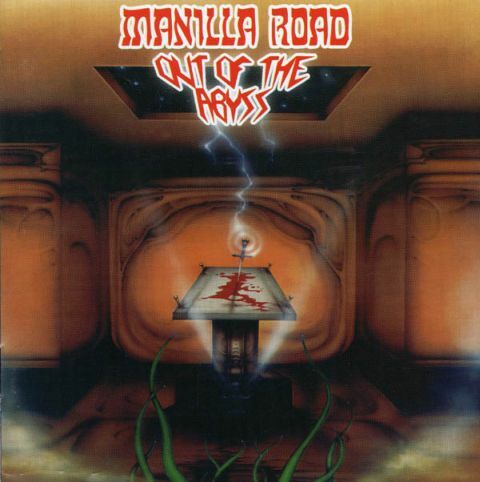 Manilla Road's seventh full-length, originally released in 1988 is an extremely under appreciated Manilla Road album. Most fans think the golden era is 'Crystal Logic' through 'Mystification', but we encourage fans to spend more time with this album. The first thing that's interesting about this album is that it originally contained one of Manilla Road's greatest Epic songs ever, 'The Book of Skelos'! The song was dropped off of the album for some unknown reason (that would be a good interview question for Mark Shelton), and later appeared on a different pressing of 'The Courts of Chaos' in which we're not entirely sure that song even made it to the first pressing of that album either. Strangely enough if you're familiar with that song and can imagine that song being apart of this album, 'Out of the Abyss' would arguably be one of the best Manilla Road albums and without hesitation would expand and be apart of what's now considered their classic era. With every Manilla Road album, it's a completely different experience as they evolved with the times. This of course doesn't sound really like anything they've done prior to this album, but it's certainly a progression to their previous 'Mystification' album. To put it in simple terms, the album is dark, evil, thrash-y heavy metal with some killer King Diamond-esque vocal screams scattered and placed just perfectly throughout the entire album. Without a doubt 'Out of the Abyss' has some of the most fastest and intense Thrash Metal not only on any Manilla Road album, but any 80's Thrash Metal album from the 80's. One of the reasons this might not be hailed as high as some of their other releases is because most albums start off with one of their best songs on the album, but this album eases you in with good song, but maybe it's a little underwhelming considering what the rest of the album is like. 'Whitechapel' is sort of offbeat, off-the-wall, and more technical than most Manilla Road songs that contain very memorable song writing with big choruses. For the first time ever, this album is being re-issued by itself as opposed to the previous re-issue which was a double CD that contained their one and only official Live album to date, 'Live Roadkill', from the same year in '88.